I am 13 years old and am in my 2nd year of Jr. High Band. My instructor told me that 90% of getting a mature/professional flute tone is based on knowing what is sounds like. Do you have any techniques/scales/exercises/recordings on developing a professional flute tone or what it sounds like? If you go to your nearest classical music CD store, there is a $6 Cd by the NAXOS label, called "Dance of the Blessed Spirits" for flute and harp. It features gorgeous standard solo repertoire with flutist Nora Shulman, and a very audible and clear professional flute tone quality. 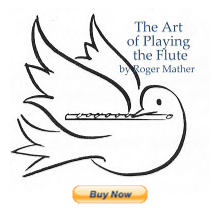 order flute CDs at these flute specialty shops, or listen online to CD excerpts at: www.amazon.com and other online CD sales places. Good questions you've asked today! !